SAUSD video says pink slips by March 15. When will Santa Ana Teacher/Councilman Tinajero say when city jail pink slips might be sent out? 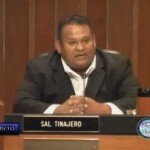 In previous articles, Shame on Santa Ana Teacher/Councilman Sal Tinajero for allowing worker layoffs and Councilman Tinajero claims he’s in minority, but he could have broken the tie vote, we talk about possible school and city union workers layoffs. Now the SAUSD Supertindent says that in addition to the 287 pink slips to be given out by this coming Wednesday, that many other pink slips will be given to other classified workers. So could the pink slips total be closer to 350 to 500? Scary figures and I feel bad for all the families that will be impacted by this, and we hope the final real layoff numbers are no where near this high.